Raksha Bandhan is one of the most popular festivals of India and is celebrated with full zeal. The celebration can’t be completed unless Rakhi, roli, chawal and of course sweets and Rakhi are included in it. This year send Rakhi to your brother living in Allahabad and be the part of their happiness. Our online portal allows you to send Rakhi to Allahabad without any stress. 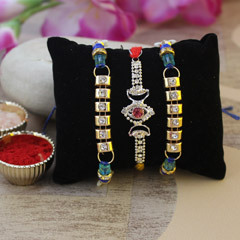 It offers amazing and unique Rakhi collection that you can explore 24/7 and place an order for Rakhi Gifts to Allahabad. Our extensive collection of Rakhi is waiting for you to explore the offered ranges. 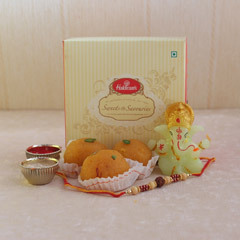 On this portal, you can buy Rakhi gifts online in addition to Rakhi for your sweet and caring brother. Ours is the renowned online Rakhi stores that have an unbelievable range of Rakhi from designer Rakhi to kids Rakhi and from Silver Rakhi to Rudraksha Rakhi. Not only this, the portal also lets you buy Rakhi online such as Mauli Rakhi, Kundan Rakhi, Sandalwood Rakhi, Chandan Rakhi, Toy Rakhi, Toffee Rakhi, Pearl & Diamond Rakhi and much more are waiting for you. One can also send Lumba Rakhi online that are bright & shiny to your Bhaiya and Bhabhi residing in Allahabad or any other city in India. In addition to Rakhi, you can also bring a smile to your brother’s face by sending wonderful gift items along with Rakhi such as photo frame, cakes, flower bouquet, cushions & grooming kit. Additionally, delight your adorable brother by offering Rakhi with Sweets, Rakhi with flowers, Rakhi with Cards, Rakhi with Cakes, Rakhi with Chocolates and lots more. 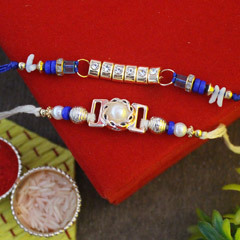 You can order Rakhi online at Rakhi.in and get its Free Shipping to your brother’s place in Allahabad on the auspicious occasion of Raksha Bandhan 2019. To compliment Online Rakhi Delivery to Allahabad, you can also place an order for fresh flower Bouquet and Chocolates along with it. We assure that entire ordered products, be it Rakhi or Rakhi Gift items, it will be delivered to its desired destination in Allahabad. Therefore, you can send Rakhi to Allahabad with an ease to your brother flawlessly.